Variable speed compressors can be an energy-efficient way to produce compressed air for industrial and domestic use. Modern manufacturing industry relies heavily upon compressed air for many important applications, and therefore efficient compressors can lead to a significant reduction in energy costs. Because of their energy efficiency, variable speed compressors can qualify for tax relief, and even for a loan from the Carbon Trust to cover the costs of installation. They are particularly useful in settings where the demand for compressed air is variable, such as the operation of pneumatic tools. They can also be used in refrigeration technology, both in industrial and residential settings, and in air conditioning systems. Traditional commercial and domestic air conditioning systems use a compressor which is either on or off, being switched by a thermostat. With a variable speed compressor, the air conditioner’s operating system can make continual tiny adjustments to adapt to the ambient temperature, leading to more a consistent climate as well as increased energy efficiency. There is a further domestic application for variable speed compression technology in the operation of heat pumps in residential settings, an application in which which energy efficiency is a crucial element. Variable speed compressors use less electricity because they can sense the pressure created by the application and adjust the running speed of the compressor accordingly so that only the necessary compressed air is supplied. Most variable speed compressors operate by converting the AC (alternating current)electricity supply to a direct current, which is then converted back via a variable-frequency AC drive. 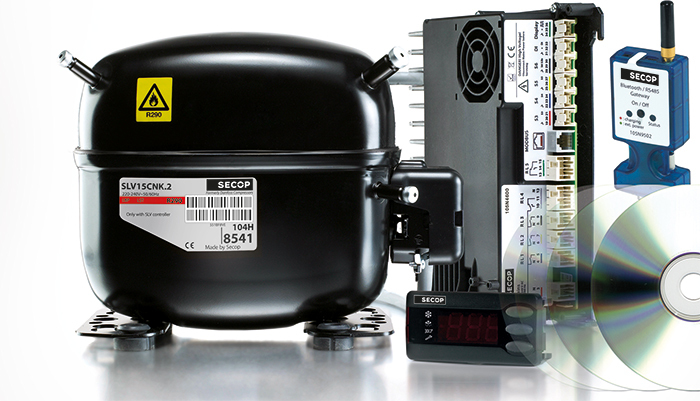 It is the variable-frequency drive (VFD) which adjusts the speed of the motor and hence its energy use. Variable-frequency drives are sophisticated electronic devices which are expensive to install, though their installation cost has decreased in recent years, as have their size and maintenance costs. The initial expense, however, means that a considerable saving in energy is required to justify their use, and in applications where the demand for compressed air is relatively constant, a variable speed compressor may not be the ideal solution.